BVECCS is your trusted emergency vet in Brisbane and is open is open all night Monday to Friday and open all day and all night every Saturday and Sunday. At BVECCS we provide you with peace of mind that your pet is in the most experienced and caring hands when it is needed most. 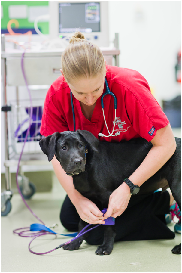 Our team of vets and nurses have over 200 years of combined of experience and hands-on expertise in emergency vet care. All of our staff have been with us at our animal hospital for some time and are all part of the BVECCS family, here to help you and your pet. Our animal hospital utilises the best equipment available to ensure your pet is provided with the best care possible. As BVECCS shares the premises with the Brisbane Veterinary Specialist Centre, we are able to access specialist support after hours (including Saturday and Sunday) for your pet if required. QUALITY CARE, All night, EVERY night. We are open when your local or regular vet is closed. We are open and fully staffed all night, seven days a the week and open 24 hours a day on weekends (both Saturday and Sunday) as well as public holidays. Upon arrival at the hospital, your pet will be assessed and triaged immediately. We have high staffing levels as compared to most pet emergency centres and the wait time to see our veterinarians are usually very short. The most urgent patients are always attended to first. We only have the most caring and compassionate staff that will make your experience with us as stress free as possible. We own pets ourselves so we understand how important your pet is to you and how they are part of the family. Even though we work late into the night and throughout weekends (24 hours Saturday and Sunday), you can expect to receive exceptional treatment and care. When you need urgent vet advice or assistance with your pet at night Monday to Friday or day and night on Saturday and Sunday we will be open and ready to help. We have an excellent reputation for service, care and trust as you can see on our testimonials page.